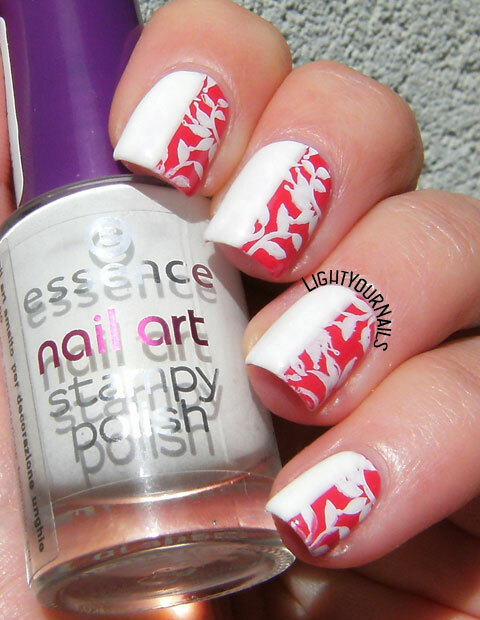 Red and white floral nail art | Light Your Nails! Oggi vi mostro una manicure che non ho ben capito se è un fallimento o se è passabile. La base è lo smalto Ulta3 Hearts Desire, su cui ho applicato dei pezzi di nastro adesivo in verticale, e sulla parte rimasta libera ho steso il Pupa French White. Ho lasciato asciugare bene, dopodichè ho preso il dischetto n. 221 di MoYou Nails, che ha delle figure alte ma molto strette, e ho stampato un’immagine floreale col bianco Essence sulla parte rimasta rossa. Lo smalto da stamping Essence non è proprio buono, ma non riuscivo a trovare il Sinful che uso di solito e mi sono adeguata. Purtroppo però la qualità e la nitidezza della stampa ne hanno risentito. Today I’m showing you a nail art which might be a fail... or not? Base colour is Ulta3 Hearts Desire. I sticked some tape on the side of each nail and painted Pupa French White on the other side. I let it dry completely and stamped with Essence white and MoYou Nails 221 stamping plate, which has some tall but very narrow patterns. Essence stamping polish is not than good, but I couldn’t find my Sinful I usually stamp with so I went with what I had. Unfortunately it kinda shows that the Essence isn’t good, the lines are smudged and uneven. This is the final look anyway. Mi sembra che questa nail art sia incompleta, come se mancasse qualcosa sulla parte bianca. Siccome io tendo a esagerare con le decorazioni ho deciso di fermarmi così, e non so ancora se ho fatto bene! Voi che dite? Vi piace? Oppure cosa pensate che manchi? I feel like this nail art is incomplete, as if something was missing on the white part of the nail. I tend to overdo my manicures so I decided to stop here but I don’t know whether it was the right choice or not. What do you think? Do you like it or am I missing something there? For me it looks nice, I would also leave it like this. I have black and white Essence stamping polishes and I love them, but my bottles look slightly different - maybe the consistency is also different? Maybe your are newer? I haven't noticed if they are still looking like this in the store. Very nice outcome. I have some MoYou plates too that have small patterns for my nails and this is why I never used them. Thanks for the great idea, I am going to try the sideways stamped pattern too :))! I am glad I could inspire you! This is the only way I could think for using those patterns! They are not *that* good so I don't think you're missing much. What a great idea for those plates that won't cover your full nail! It might be fun to have a simple black detail on the white side. I love this idea!! Thank you so much for the suggestion! 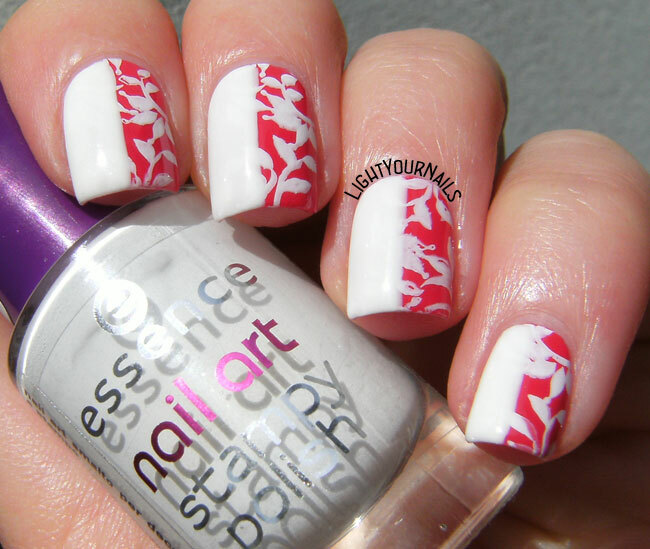 I must say that i like this mani,something different! Totally not a nail fail! I really enjoyed the mani and the post. I don't think any thing is missing! I really love the design! Too bad the stampy polish isn't that great.. I think it gets old too fast and that's why it starts smudging? But it doesn't bother me, I think this is a beautiful classy summer look! Do you think so? I've never thought it could start smudging due to being old. I think it looks perfect !